View Taylor Phinney’s power file HERE or by clicking on the image below. Paris-Roubaix is known as the “Hell of the North” and for good reason. Even with the weather not being as dramatic as was predicted earlier in the week, the 2018 race was set to be a fight to the end, and it lived up to its title in every context. Some things to note about the conditions in which Paris-Roubaix is raced on and how the 55km of pavement and road conditions can affect the power and force applied by the riders. A key physiological demand to note is how power is produced and force applied by the riders as they cross the flat cobbled sections at full speed. When we compare riding a two to three minute effort at a high intensity on a normal surface to that of riding on the cobbles of Roubaix, we see massive differences in how the force is applied. The requirement to engage many more muscle groups and adapt your posture/position on the bike has a greater energy requirement on cobbles compared to that on a normal surface. The requirement to do this repetitively (over the 29 sections of cobbles) takes a major toll on the body as your ability to recover is reduced and the consistent jarring and impact of the cobbles on your ability to maintain a higher power/force time after time is greatly lowered. We have seen over the years that riders who have the ability to absorb this jarring and punishment time after time, section after section, are those who are fighting for the win at the finish. Another big difference between Roubaix and other classics is that the start of the race is never a relaxed affair. If we look at Milan-San Remo, Flanders and some of the other “semi classics” which the riders take on early season we can see that the first couple of hours are done at a relatively relaxed pace for the team leaders and those domestiques who are normally spared for the end of the race. This is not the case here. 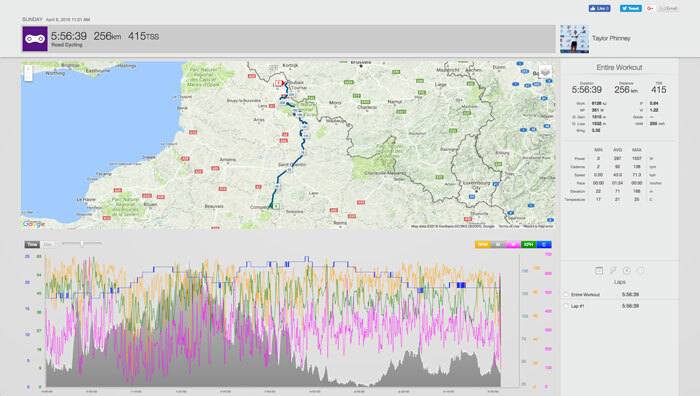 Phinney actually did his peak one minute power after only 27km of racing. He did 676w, 7.82w/kg in this big effort, we assume this was him trying to get into one of the early moves which was trying to get away prior to the first cobble sections. A big effort in the opening 45 minutes of the race again proves how hard the riders need to push themselves to make that first break of the day. Another critical part of the race were the first two cobbled sections of Troisvilles, 93.5km to go and then shortly after that the section of Briastre. It was on the Troisvilles that a large crash split the main bunch and caused some panic within the main group which consisted of most of the pre-race favorites. The main players normally use the Arenberg as a signal to start opening their account and to start reducing the groups to a more select few. The Arenburg is the harshest of the cobbled section and it is critical to be close to the front on the approach. For this reason the fight to be in the front is hard and this is reflected in Phinney’s data as he fought to maintain position at the head of the bunch. The pace continued to stay high as he rode over the unforgiving cobble stones and he came out of this section close the lead of the bunch. Phinney was aggressive on the approach to Mons-en-Pévèle with around 45km to go, here he attacked the main peloton and tried to cause a split to again reduce the leading group. It was on the approach to this sector and during it that he produced his peak 10 and 20 minute powers. This hard effort proved to be very beneficial as Phinney made the front group and was then able to help his teammate Sep Vanmarcke who also made the front selection. The race proved to be a day for Sagan as he maintained his lead with Silvan Dillier, behind Taylor was in the second group only two minutes down as they approached the velodrome. The sprint for seventh place proved to be a massive last effort and it is impressive to see such high powers after already 260km of bone jarring roads. During the sprint Phinney produced and average power of 860w, 9.95w/kg for the last 400m (27 seconds). He hit a max power of 1381w, 15.97w/kg as he finished second in his group sprint to see him eventually finish a fantastic eighth place. It was a truly epic day in northern France and this performance again cements Phinney’s natural talent on such courses and no doubt maintains his ambition to one day be on the top step in Roubaix.